Dr. Raghu Puttaiah is a tenured Associate Professor in Diagnostic Science and the Director of Infection Control at Baylor College of Dentistry, Texas A&M University System Health Science Center in Dallas, Texas, USA. He has conducted numerous research projects in the field of Dental Infection Control and Occupational Safety, dental materials/devices development and testing. 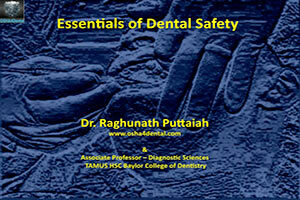 In this video presentation, Dr. Puttaiah will review the essentials of infection control for the dental office. A history and evolution of infection control, clinical surfaces and methods of control and common infectious diseases will all be reviewed. Take time to review these very important concepts to protect yourself and the patients you treat. Briefly describe the definition of infection control. List the three types of methods of infection control. Review common adult and childhood communicable diseases. Describe the methods of control for common communicable diseases. Differentiate the types of environmental surface disinfectants. Understand the common methods of sterilization in dentistry.